There are five words that best describe Kaitlin Anseeuw’s rise through the world of gymnastics – provincial, national, international, gold and silver. She has competed successfully at all three levels and her trophy case is lined with gold and silver medals. As an elite amateur athlete, Kaitlin was able to prove herself on a provincial, national, and international level. 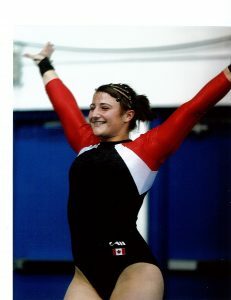 A gymnast since the age of three, Kaitlin began her athletic career with the local club in Delhi before moving on to the provincial level with the Simcoe Gliders Club and later, the Grand River Gymmies in Caledonia. Following a serious achilles injury, Kaitlin decided to switch her focus from artistic gymnastics and by 2002, at the age of 14, was competing and winning nationally in the trampoline, double-mini trampoline, and power tumbling. With winning results from national competitions, Kaitlin was chosen to represent Canada twice at global events in Germany and the Netherlands. Unfortunately she was injured prior to the German competition but came back the next year to capture a sixth place finish in Eindhoven, Netherlands. In addition to competing, Kaitlin received many other honours. She has twice been recognized locally at the Breakfast of Champions and also nationally with a Canada Youth Day Award in 2006. Kaitlin continued to play a major role in our community as a coach and volunteer for multiple organizations throughout Norfolk County. She is often described as a true leader, an inspiration, and an ambassador for all that she does.